It was another bank holiday, so you know the drill - I was on the bike touring. This time I decided to avoid the Sustrans offroad routes that were such a pain last time, and developed my own on-road route. For the most part, it went really well. I headed north-east from Cambridge to a campground in a speck of a town called West Row, slightly above Mildenhall. That worked out at about 45km, and was a nice cruisy ride. The next morning I was up and on my bike just after 8am. I left my belongings in the tent, and headed further north-east through the town of Brandon to Thetford Forest. It was a scorcher: I could see the heat radiating off the road quite early in the day. 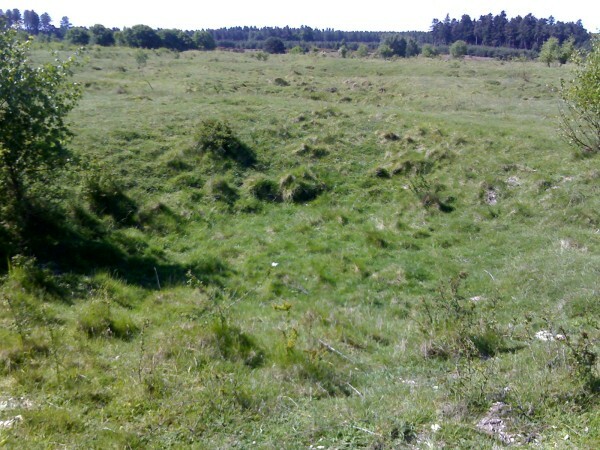 In Thetford Forest there is a large field dotted with depressions called Grime's Graves. "Grime" from "Grim" (the Anglo-Saxon name for the god Woden), and "grave" meaning a quarry or hole. 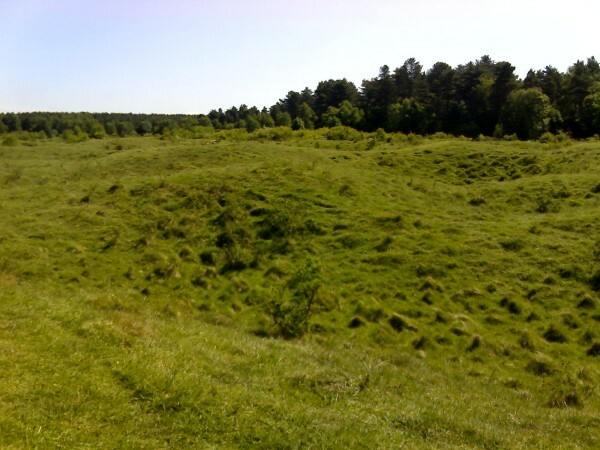 So according to the guidebook, the Anglo-Saxons had some idea of the purpose of the holes, but this was lost in later times when it was thought to be the location of a Viking camp or fortifications. Do you remember my post about Norwich? 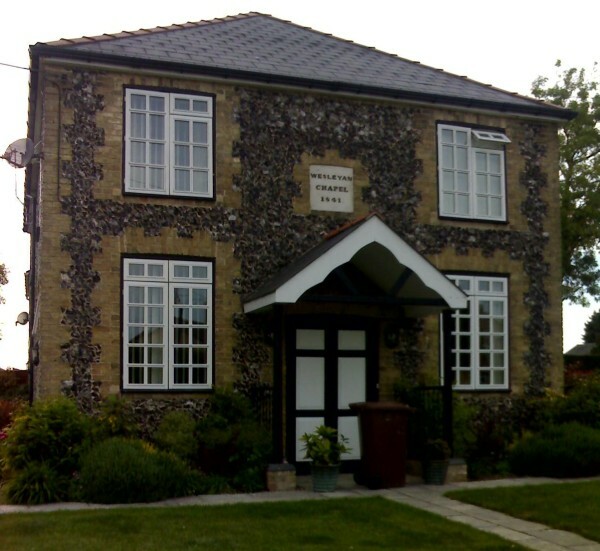 The common stone on the buildings out on the East Anglian coast is flint, and that's why these holes came into existence: They are neolithic flint mines. 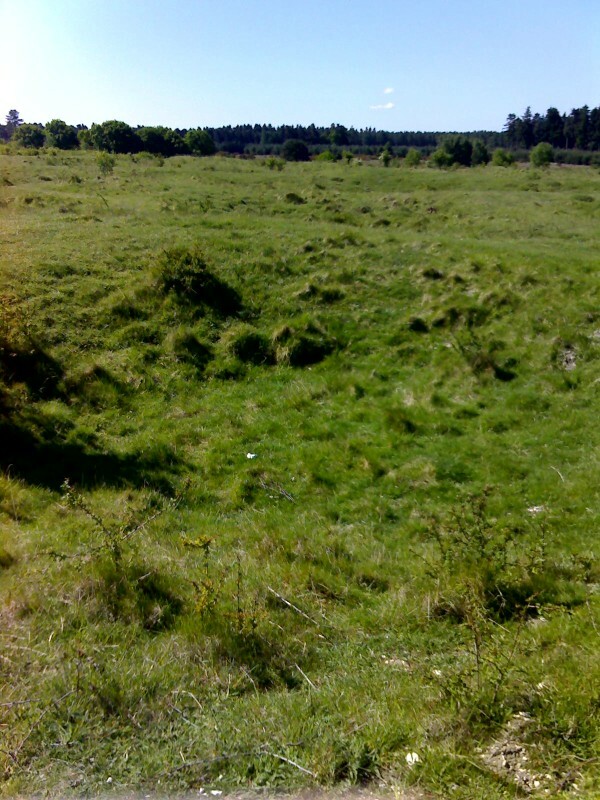 The Grime's Graves site is a chalk-covered hill, with the flint up to 9 meters down beneath the chalk. The pits were dug from 3000-2000BC. There are currently 433 known holes, although there may be others that have not yet been discovered. Flint is a hard stone that creates sharp edges when it breaks, so it is excellent for tools. How did the neolithic people know to dig down for 9m to get to the flint? Beats me. I guess when you don't have TV, digging really deep holes is the sort of thing you do in between bedding Ayla. There are other flint mines around England, but this is the only one you can actually climb down into. They made me wear a hardhat, which is the sort of nannying that really annoys me, but then I smacked my head on the ceiling of a cave I was crawling through, so I guess that was a pretty good precaution after all. Overall, I have mixed feelings about Grime's Graves. It was a fair slog to get there, and there isn't actually much to see. It's mostly just a big field with dips in it (see below). In NZ it would be pretty special, but in England there is so much palpable history that this comes across as a bit lacking. Also, I had to bike along a road called the A134, which turned out to be a little busy. The speeding cars helpfully honked, just in case I had forgotten I was a guy on a bike. Speaking of average tourist sites, I took a 20 meter detour in Burwell to check out the former castle. Totally not worth it. If a clump of weeds in a paddock somehow counts as a castle, then Dad, I think we may've had a castle behind the garage. The second day ride was over 100km - I'm still not judging the distances well.